Turns out the California Mille is a vintage car rally for 1950s-1960s vintage sports cars (thus the similar name to the classic Mille Miglia rally in Italy). 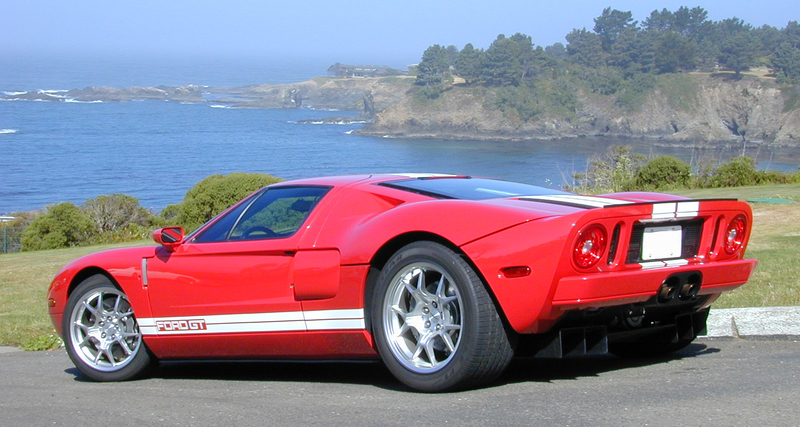 The Ford GT wasn’t exactly vintage in the spring of 2004, but it was a car that many California Mille participants (i.e. wealthy sports car owners) would likely have on their radar. The organizers decided to let the Ford GT tag along with the 250 GTs, 300 SLs and XKEs. There were several legs to the rally, which would travel up and down the California coast over several days. Ford let multiple journalists drive the car, one on each major leg of the rally. My leg turned out to be the last one on the California Mille, starting at Fort Bragg on the coast, well north of San Francisco. 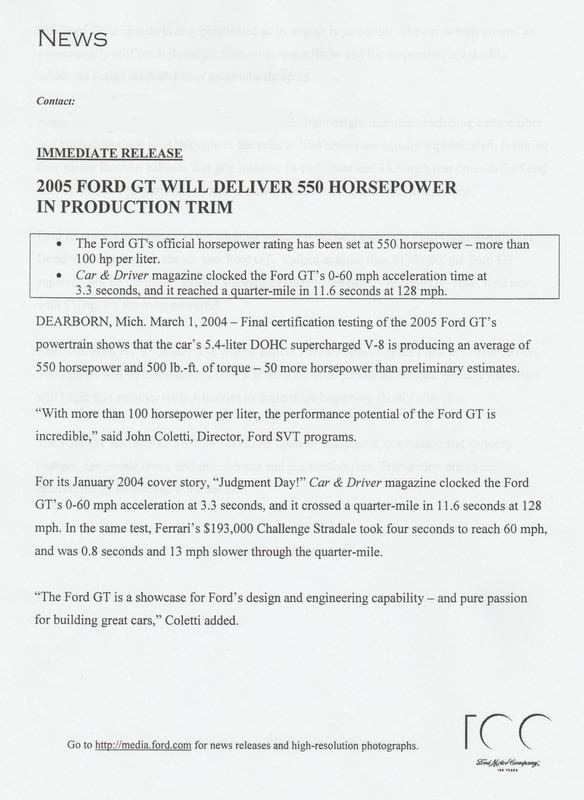 I drove up to meet Ford’s head of communication for the GT, Andy Jacobson. Andy was essentially babysitting the car, making sure no journalists got stupid with the GT on some twisty California two-lane road during the rally. We actually met in Sonoma and he drove me in the GT from Sonoma to Fort Bragg, a 2-plus-hour drive. At that moment I knew I’d be buying a Ford GT, as all concerns of how I’d pay for it flew out the window. This vehicle was the one and only mid-engine V8 production sports car designed and built in America. Ever. I’d driven it and knew how amazing it was, and I knew people at all wealth levels would (rightfully) be stepping over each other to get one. And I’d just been told I could order mine the way I wanted and be guaranteed to pay MSRP. Done. Over. Fini. The words flashed like a neon light across my consciousness: I’m getting a Ford GT! That news alone would have established “moment in time” status in my life’s memories, but there was more. After arriving at our hotel in Fort Bragg I had a restless night’s sleep (go figure…) followed by a day of driving the GT throughout the California Redwoods north of San Francisco. Andy rode in the passenger seat as we discussed everything from the GT’s final development process to who else had made “the list.” He was pretty discreet about who had made it, but he let slip some of the names that didn’t (bummer for you, Madonna, Stalone and Brooke Burke…). 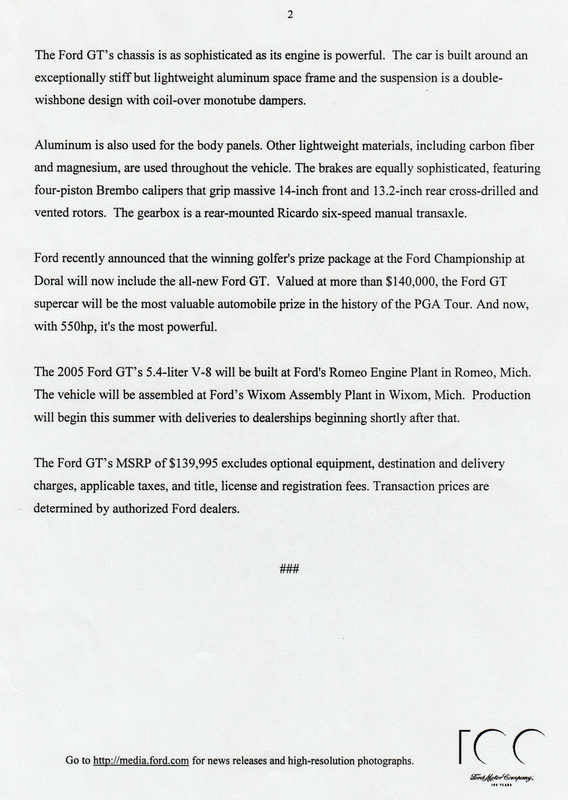 Apparently some 700-plus people had contacted Ford about getting special access to buy the car at MSRP, but only 122 made the cut. Thankfully, John Clinard was also attending the meeting, by phone, and his voice crackled over the speaker from California: “Karl Brauer is someone we actually built the car for. 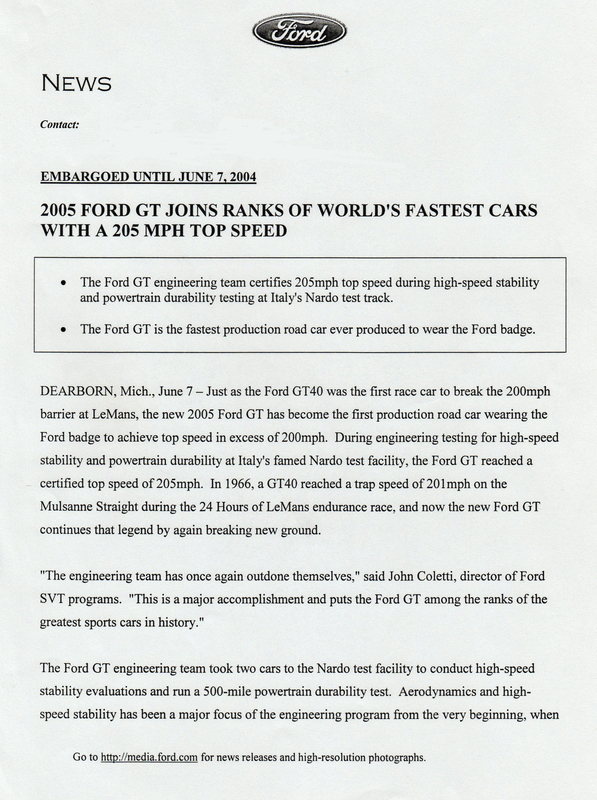 He’s a genuine, longtime automotive enthusiast who will drive the car and enjoy it versus putting it in a hanger next to 18 other collectible cars to show off to his third wife.” Andy told me there was a brief pause while Bill Ford Jr. considered the statement, then he shrugged and put his initials next to my name. Eventually we made it back to Sonoma in the GT, where Andy meet up with some other Ford folks to get a ride to SFO. It was about 4 in the afternoon, and at this point I wasn’t sure what the plan was. He got out of the car, turned around and said, “This car has to be at Page One before 5 p.m. tomorrow. Have fun.” Page One was Ford’s press vehicle company in San Francisco. 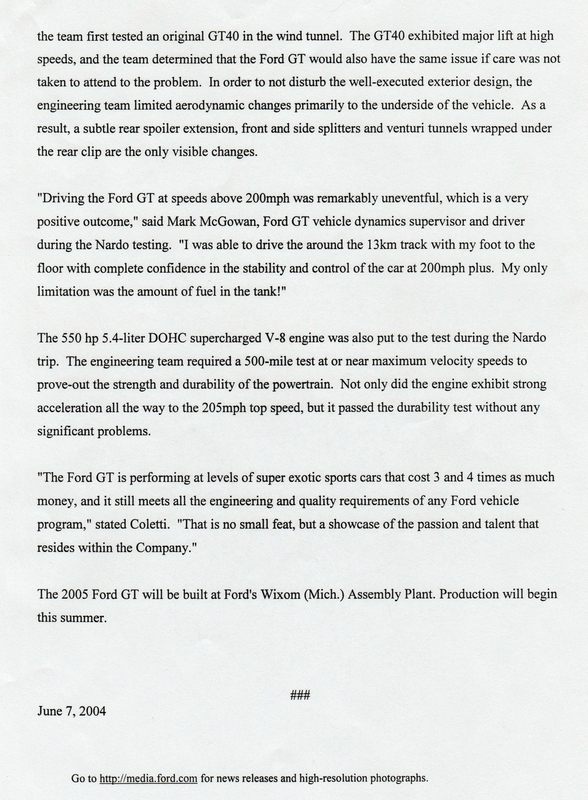 Andy had just given me free reign in a pre-production Ford GT test car, in Napa Valley, for 24 hours. The other journalists on the California Mille had spent their entire seat time in the GT with a Ford rep riding shotgun, but I was getting a full day to myself. I spent the next 24 hours exploring what I’ve always considered the most beautiful region of California. As any one who knows the area can confirm, the roads there are incredible. My experience from 6 months earlier, at Gingerman Raceway, confirmed the car was exceptional on a track, but I wasn’t sure how well those traits would extend to public roads. After 24 hours I knew they extended seamlessly, with the GT not only providing world-class supercar performance but also superb comfort and ergonomics. I remember specifically going down a perfect canyon road with sweeping turns connected by extended straightaways, and thinking, “I can’t imagine going any faster or more confidently down this road in any other car.” This was coming from someone who had plenty of seat time Ferrari 360s, Lamborghini Gallardos and Porsche 911s. “GT” was the ideal name for the car, more fitting than any “Gran Turismo”-badged vehicle before it in my not-so-humble opinion. I’ll post the road test that came out of this Ford GT experience in the next day or two, but the video from this drive is above.